2019 Daily Adventure Rates - NEW & SIMPLIFIED! Book online and get $5 off each adventure! Be sure to complete your waiver prior to arrival and check-in 20 minutes before your adventure is scheduled to begin. Full Tower Access (except Kids Course) is for anyone Over 140cm. Under 140cm but above 125cm may have Full Tower Access as long as they are accompanied on the upper Tower with a Chaperone over 140cm. The Kids Course (or Ground Level) is restricted to anyone under 140cm. Under 125cm must have be accompanied by a harnessed chaperone (No Charge for Chaperone on Kids Course). Introducing: The EXTRA Value Card! The EXTRA Value Card is a 10 visit punch card for just $300.00 + tax. You SAVE over 28% off the regular walk up rate ($42)! 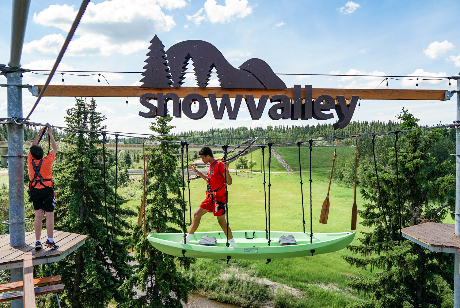 Pick up your EXTRA Value Card on your next visit to Snow Valley Aerial Park. Other Destinations include: Jasper Tram (15% off), Sunshine Summer Gondola (TBC), Resorts of the Canadian Rockies (TBC) and more with a valid card (A valid EXTRA Value Card has no more than nine (9) punches). Any time beginning with the last 2.5 hours before closing. Applies to walk up and online rates. A Dedicated Guide is available on request (+$60 for 3h). Download Birthday Brochure. BOOK NOW by contacting our School Group Coordinator at 780-809-2373 or by email here. *Valid May 18 to June 27 and September 3 to 29. No Access July and August.